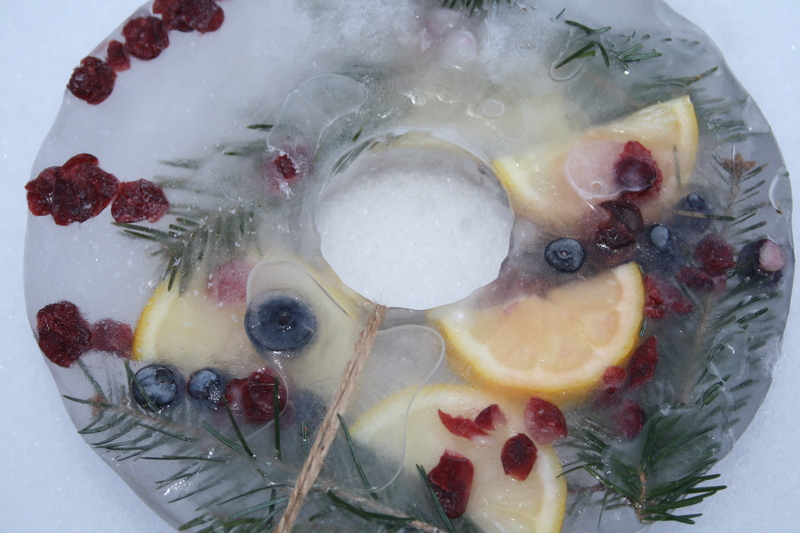 I love the way these ice wreathes catch the ray of the sun making them sparkle. With the days getting longer I thought I could make a couple and still get to enjoy them each night out my two kitchen windows. The next time my two little angels are here for a sleepover we will have to make a couple more. 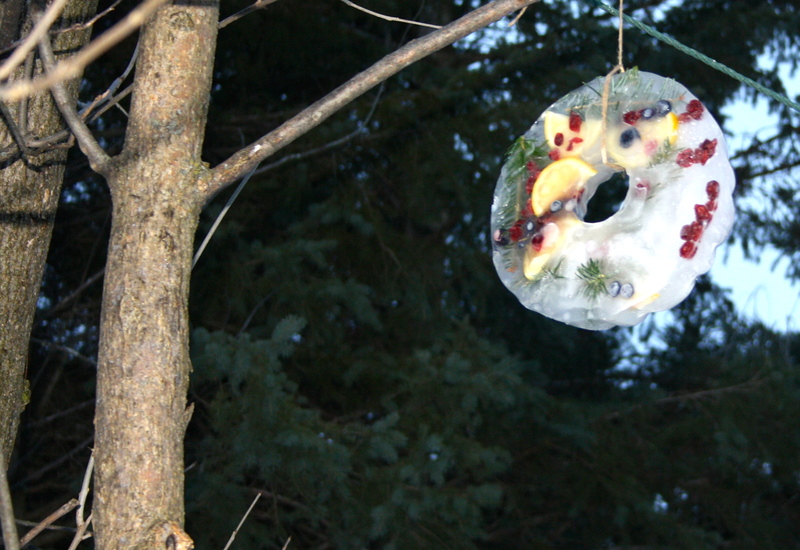 Besides waiting for them to freeze, twice, they are super easy and great fun for the kids. 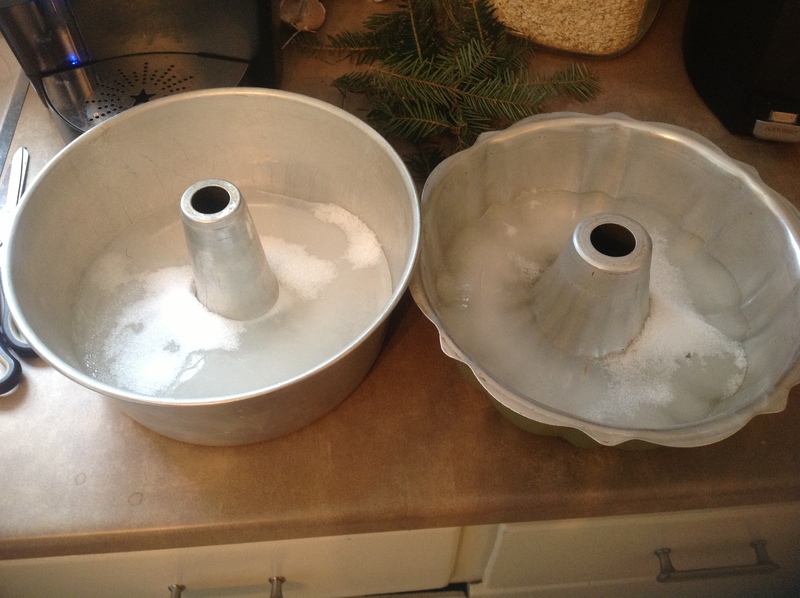 First I started with two bundt pans filing them with water about 1/3 of the way. 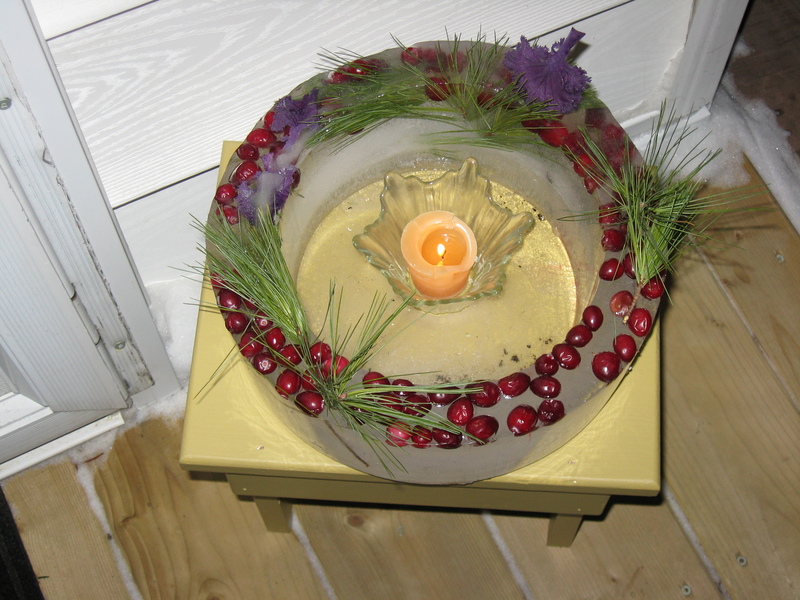 I then placed them outside. It was super cold and probably would be for the week. 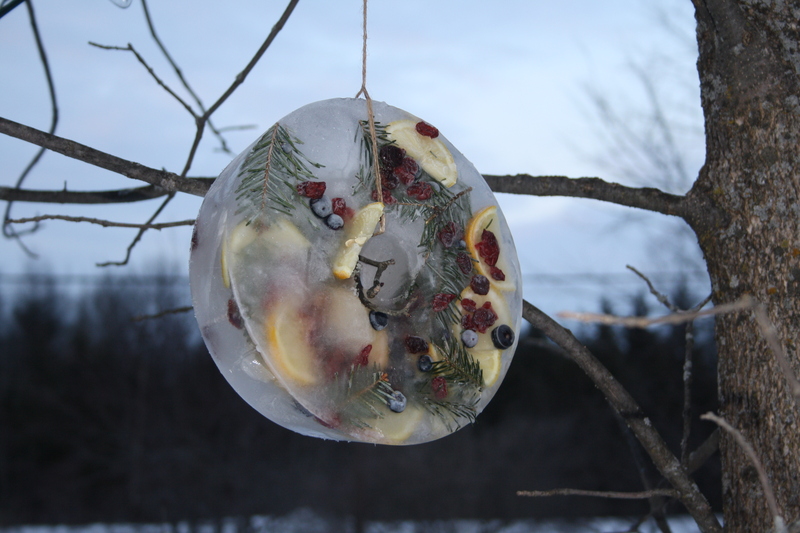 I really wanted to pick up some frozen cranberries. Well the week past, the days got warm and I kept forgetting to get my cranberries. 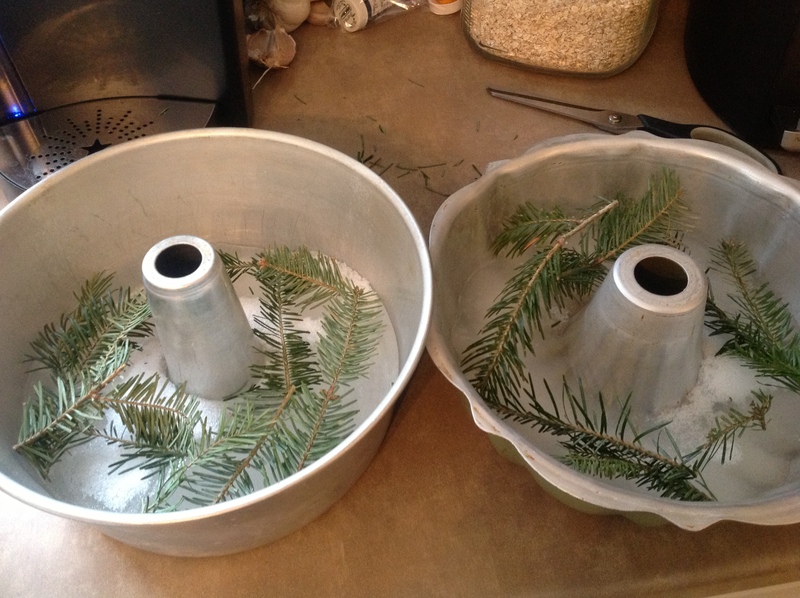 Today I am finishing them no-matter-what even if my frozen wreaths are melting by the minute. 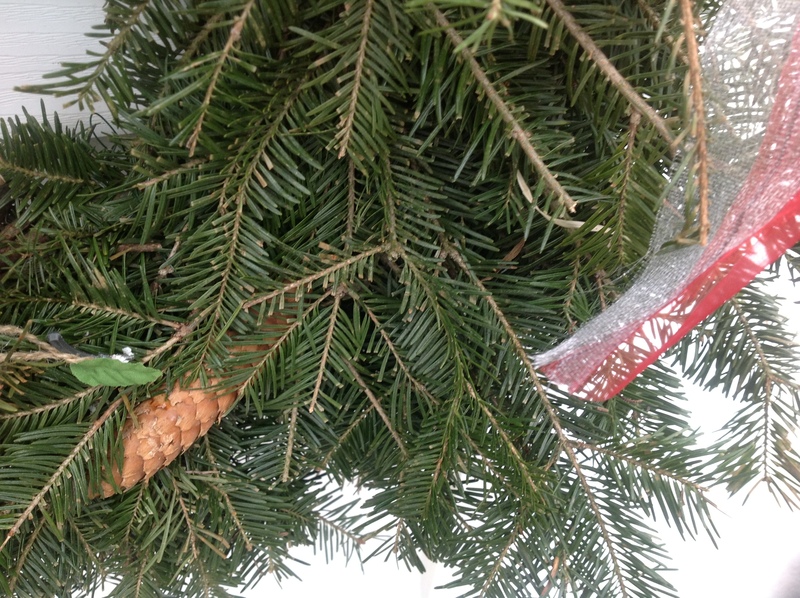 I cut a few pieces from my Christmas wreath, yes it’s still looks great! I then cut up a couple of lemons I had. 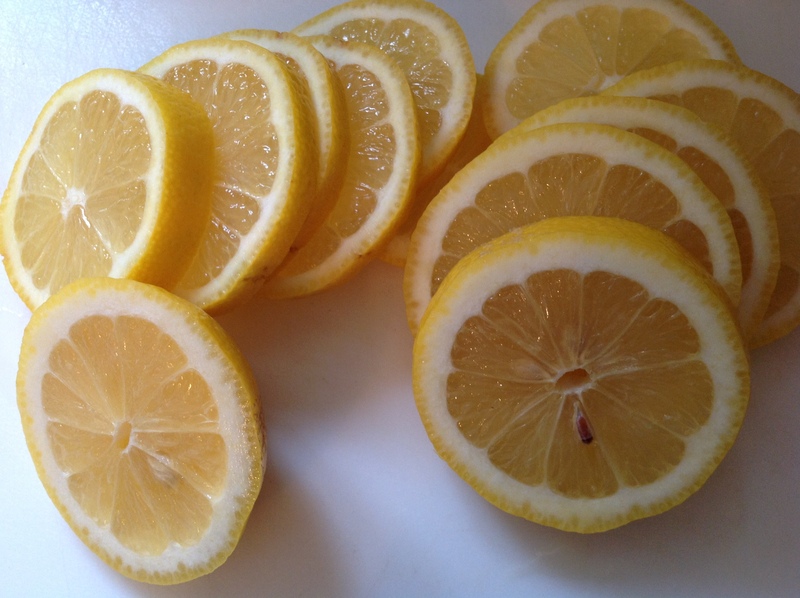 I love the look of lemons, so bright and cheery. 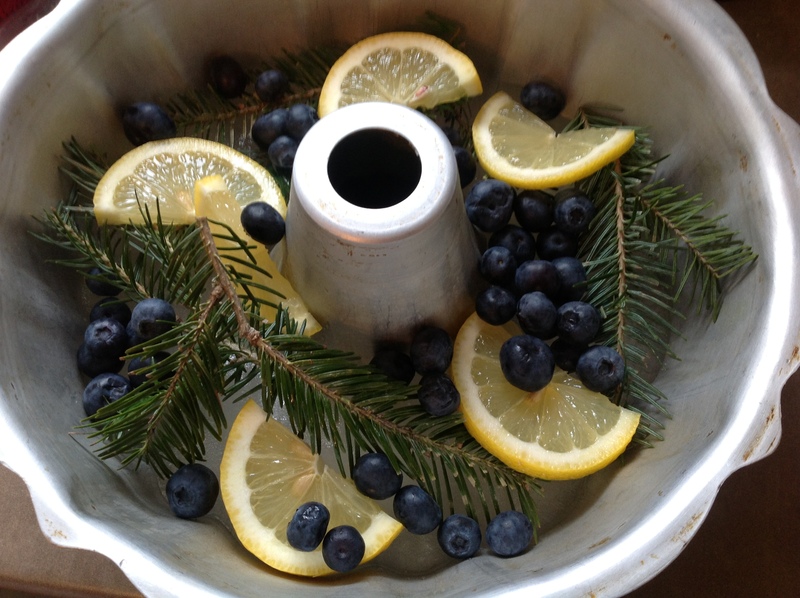 I then added a few blueberries. 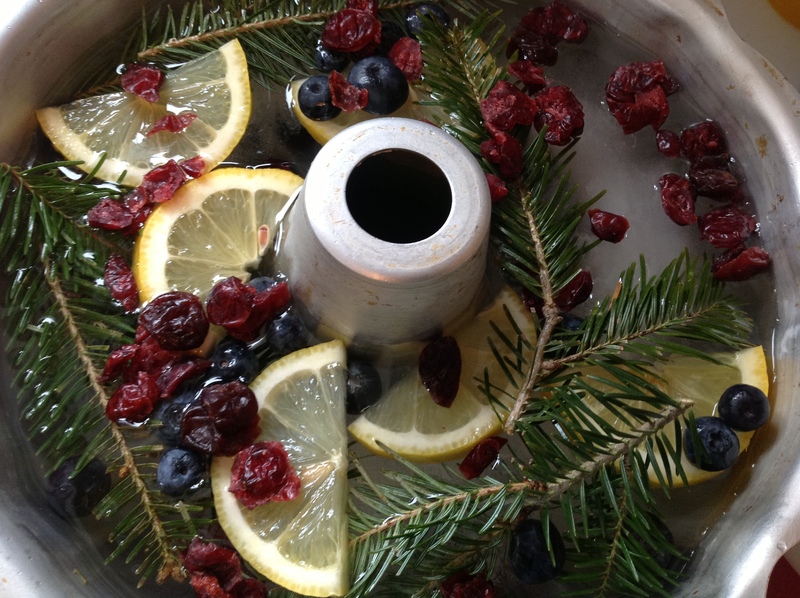 Then someone else got involved and added some cranberries and some cherries! Top up with some more water. 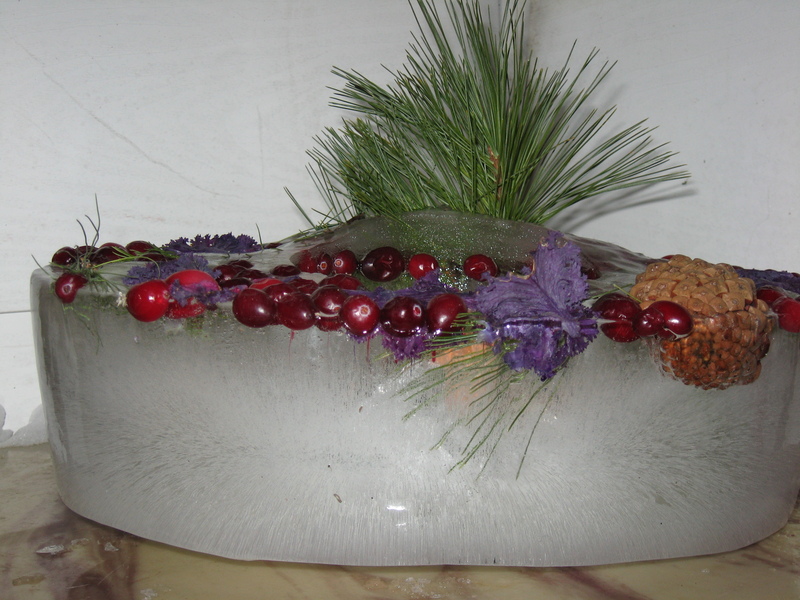 With mine melting my ice gave a way and started floating to the top, I hope they turn out and look as pretty as they do now. With the warm day they went into the freezer this time. You’ll have to come back to see what they look like hung up outside. 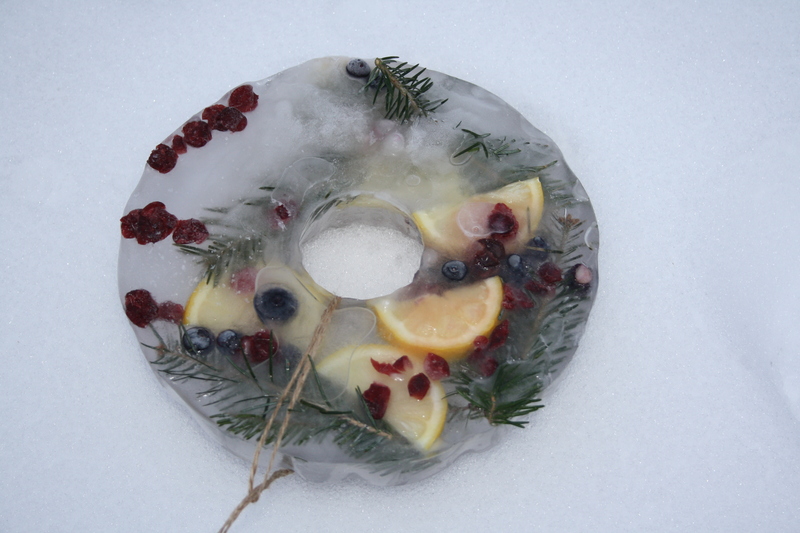 Do you make any ice wreathes? I would love to see them. A small note first, my eldest granddaughter has a dairy allergy so I have never made these with butter I have used Soy Margarine. Everyone loves them! In a small bowl, combine flour , almonds and cinnamon; set aside. 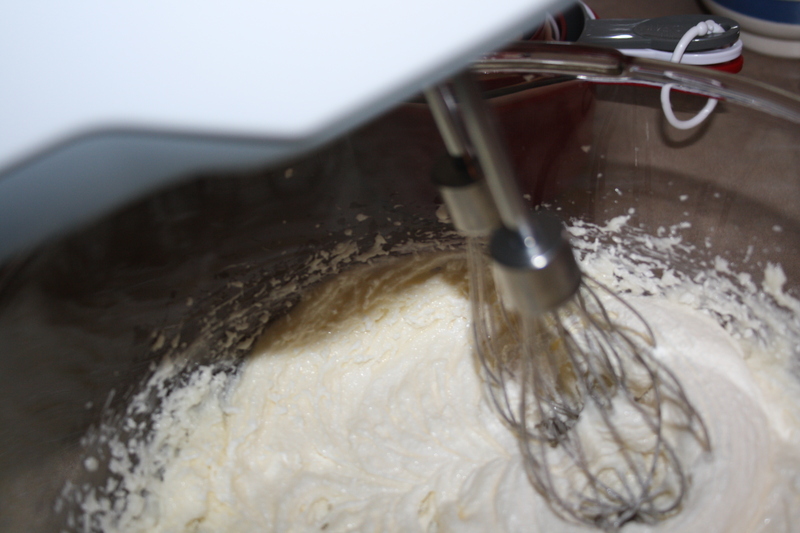 In a large bowl, beat butter and sugar with electric mixer until light and fluffy. Add egg and vanilla; mix well. Add flour mixture and mix only until incorporated. 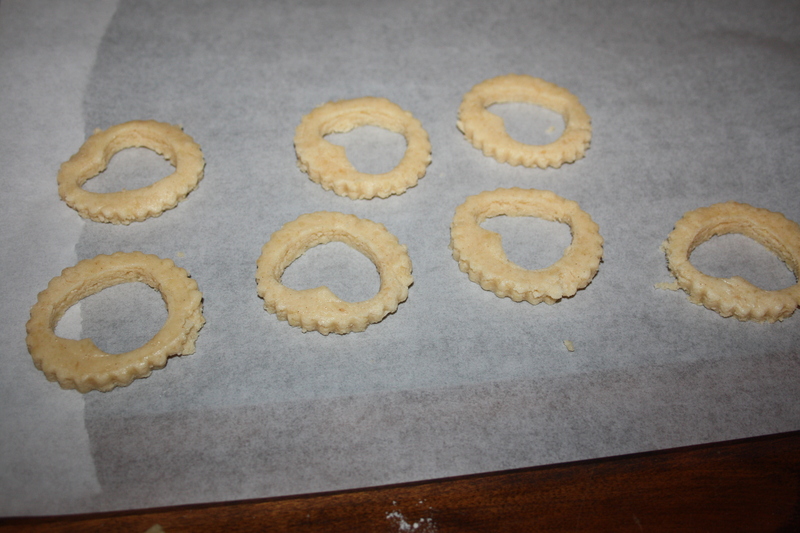 Divide dough into 2 and press into small disks about 1 inch think. Wrap separately in plastic wrap and refrigerate for 2 hours or until firm enough to roll. Preheat oven to 350F. On floured surface, roll out one disc of dough to 1/8″ thick (keep other disk in the fridge) I have to say here that I did take some great pictures of each step and for some reason they did not get transferred to my computer and I deleted the pictures off the camera. Ugh! Cut half of the dough using a round cutter. I happened to have one that made the ridge design. 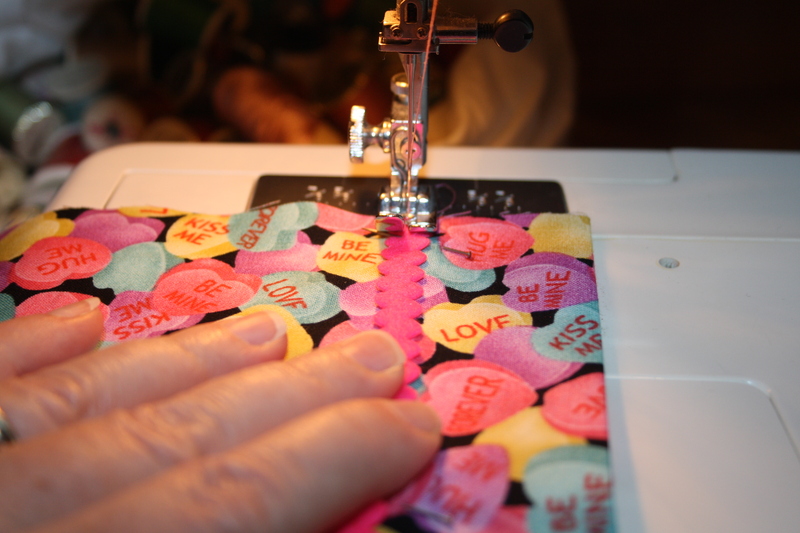 Cut an equal number of rounds using the same cutter and then using your small heart cutter cut out the centre. I also decided to save some of the heart cut outs rather than rolling it back into the dough. Transfer the cookies to parchment paper lined baking sheets. Dough scraps can be formed back into a disk and chilled again for 30 min. Bake 10-12 minutes or until light golden brown. 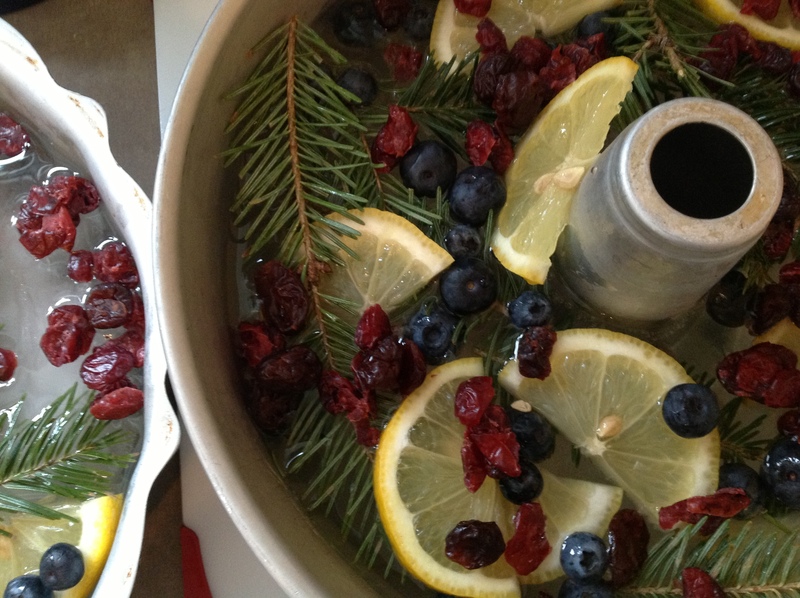 This all depends on your oven and baking sheets. I had to bake mine a little longer and the first set I did on an air bake sheet that took longer, the second on a dark cookie sheet, both still on the parchment paper but these ones cooked much faster, getting a little darker than I would have liked. 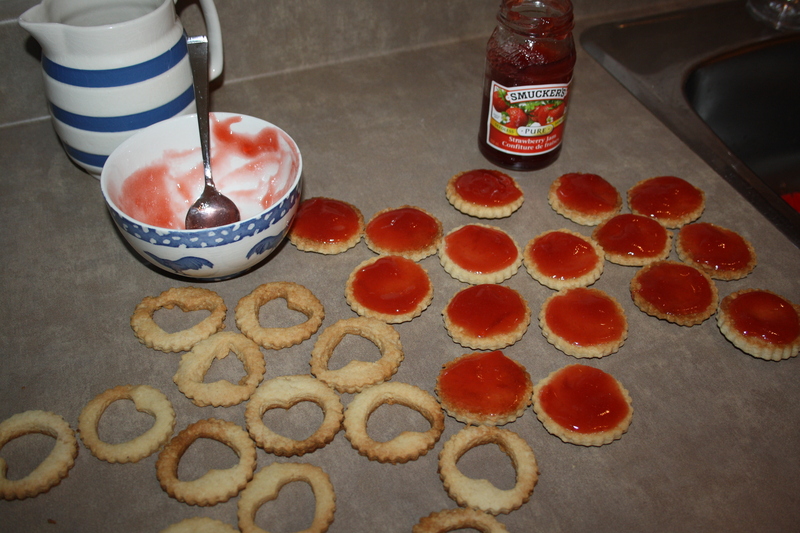 Cool the cookies completely and then spread the bottoms with the jam. I spooned my jam into a bowl and mixed it well with a spoon to warm it up a little and make it a little more spreadable. 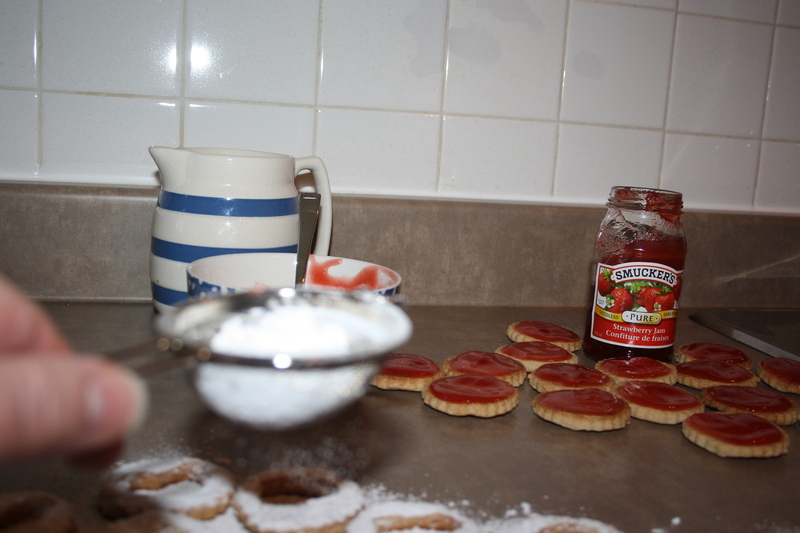 Dust the tops with the confectioners sugar (icing sugar) and then sandwich them together. Then have a tea party! 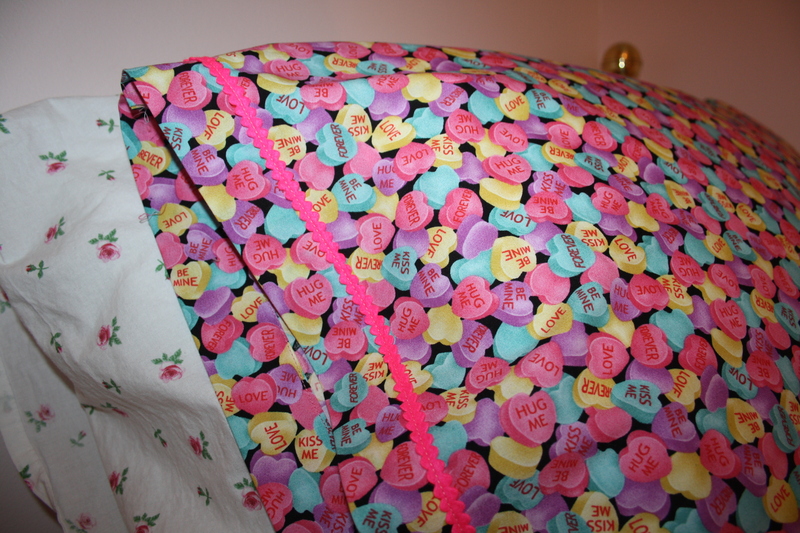 As promised, I’m back to attempt to show and tell you how to make a pillow case. Attempt being a very important word here. I am by no means a seamstress. 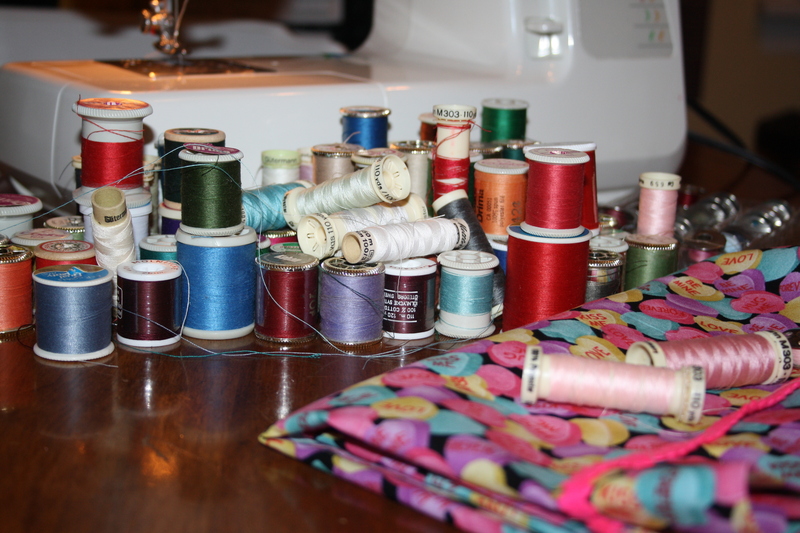 I can make curtains and sew some craft items but I do not pretend to be able to sew. So let’s just say this post is for all you no sewers out there. 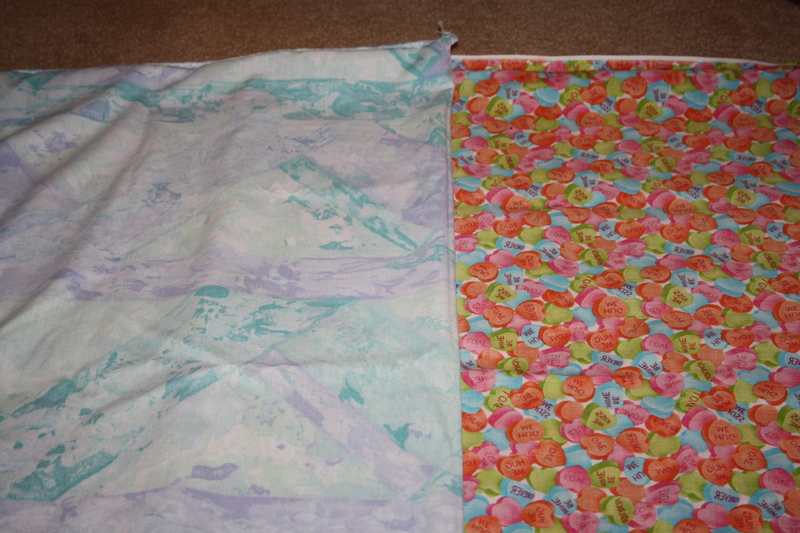 I purchased 1 meter of each fabric but I think the next time I would get a little extra like 1 1/2 meters. 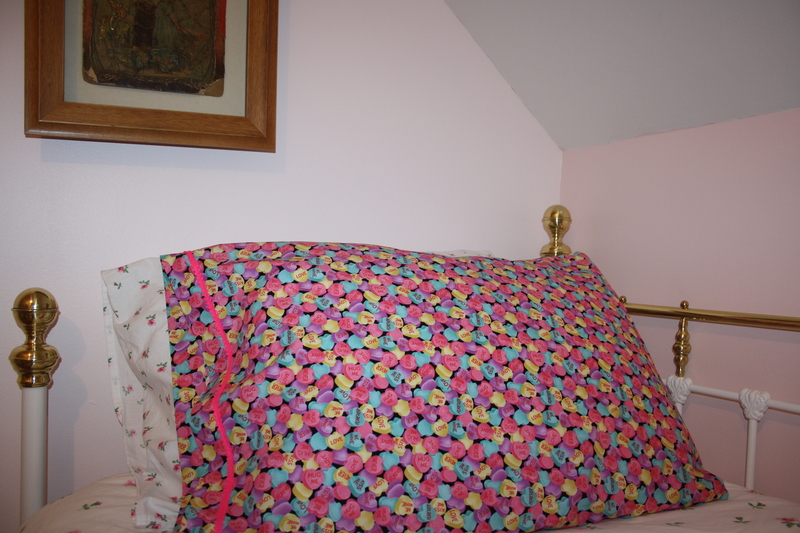 I then used a pillow case to measure out the size adding approximately 1″ for each of the open sides and 2 1/2″ for the top. My open sides were one side and the bottom. I allowed for a 2 1/2″ top, 2″ for the top and there is about 1/2″ folded under that, ironed down and then sewn, you can see that with the white stitching, this is so that it does not fray in the wash. You can make a larger fold over at the top if you wish, it’s all preference. 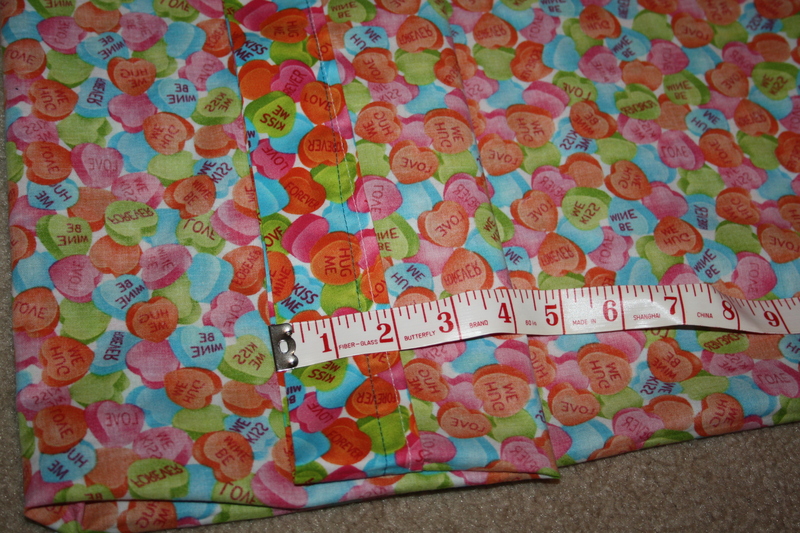 I then sew my top portion first. 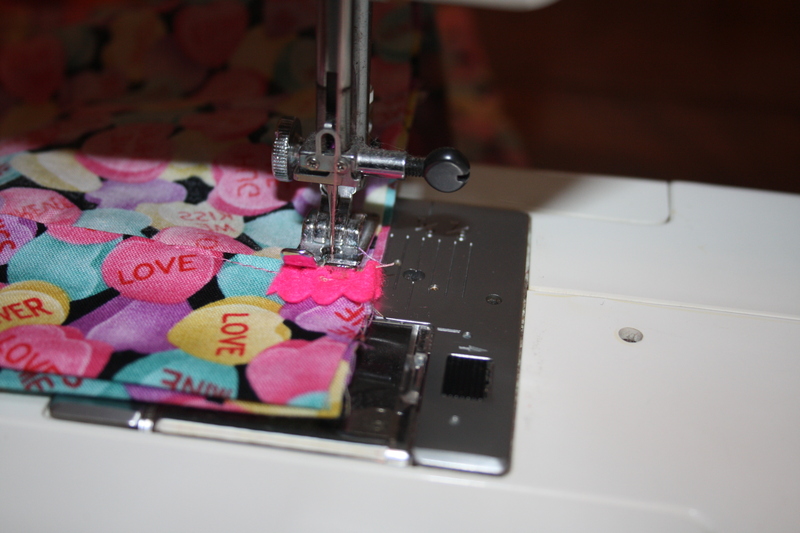 A note, if you have a surger…..you probably don’t need my tutorial HA) you wouldn’t have to leave as much as the 1″ you can leave about 1/2″ and then surge all along to keep the ends from fraying. If you don’t have a surfer I would leave the 1″ that allows you to fold over to 1/2″ and sew down along this line, that is after you press it all so that it stays folded. 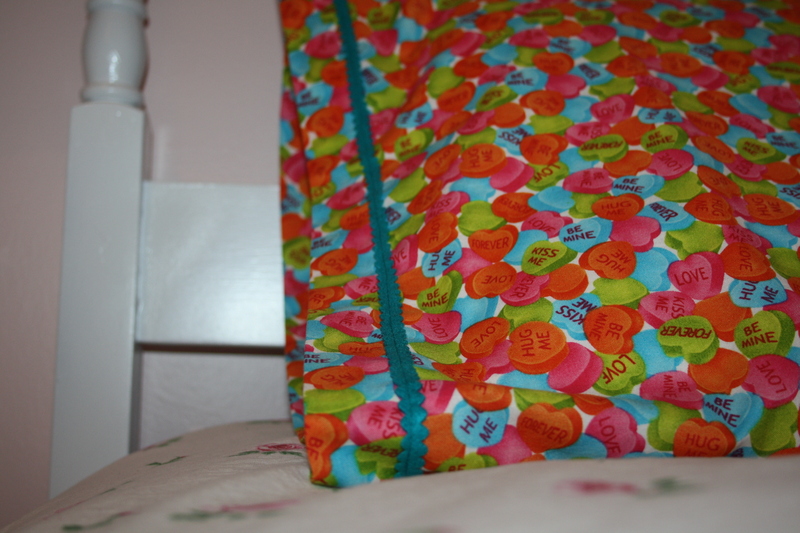 On the top of my pillow cases I wanted to add a little extra. Well actually I didn’t but I came across these beautiful little ribbons, 10 for $1 so that is what decided for me to add the ribbon. 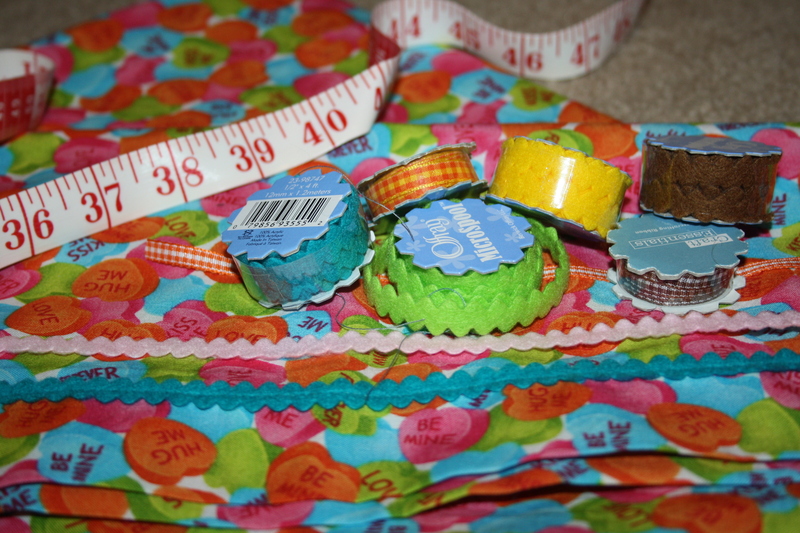 When choosing your thread it’s best to lay a few across the item you are going to sew and pick one that seems to disappear in the fabric. You would be surprised that it’s not always the lighter one. I recently picked up this bag of thread at an estate sale, thinking what in the world am I going to do with all this thread, I don’t even sew! but I tell ya, I have had the sewing machine out a few times and didn’t have to worry about whether or not I had a colour, I think I have just about every one here. So I am very happy with my thread purchase. When you get to the thicker ends it’s best if you turn the wheel by hand, with my machine anyway. Maybe if I used a bigger needle it would have gone better, but turning it a bit by hand was fine. You can see below that my tops don’t come together perfectly, but when it’s put on your pillow and you are dreaming of love, it really doesn’t matter. Hope my first tutorial wasn’t too difficult to understand, I will get better……I think! 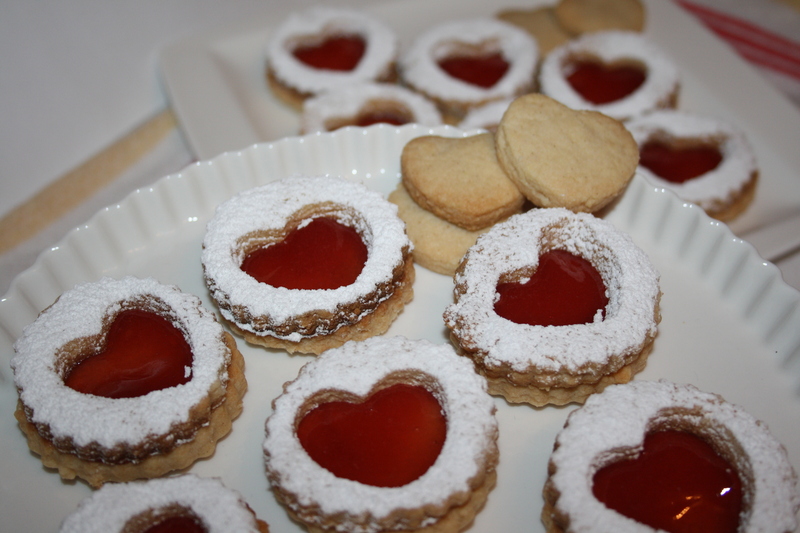 Tomorrow I will be back with the recipe to make the heart cookies. 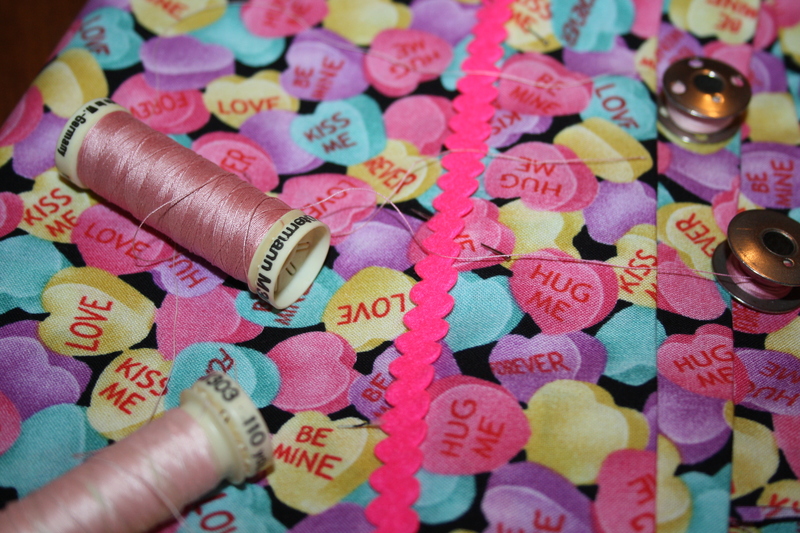 Categories: Sewing | Tags: valentines | Permalink. On Valentines day if I am buying a gift for someone special it has to be Valentine related. I just can’t buy some random gift. It has to fall into one of the following categories; it has to be red or pink, chocolate or flowers, if it’s a book, it has to be about love or Valentine Princesses and if it’s clothes it has to be red or pink or just be Valentine related. You get my point…..maybe. It can’t just be some random gift that you would buy say for a birthday. That’s just my thing. 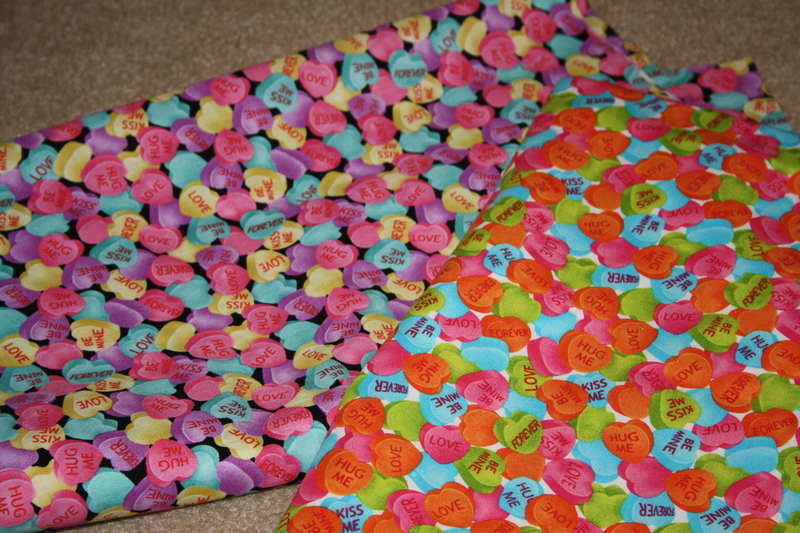 So putting together the girls gifts for Valentines this year I decided to make them pillow cases. Bonus for me was, one included the colour pink and the other orange. Each of them their favourite colour. 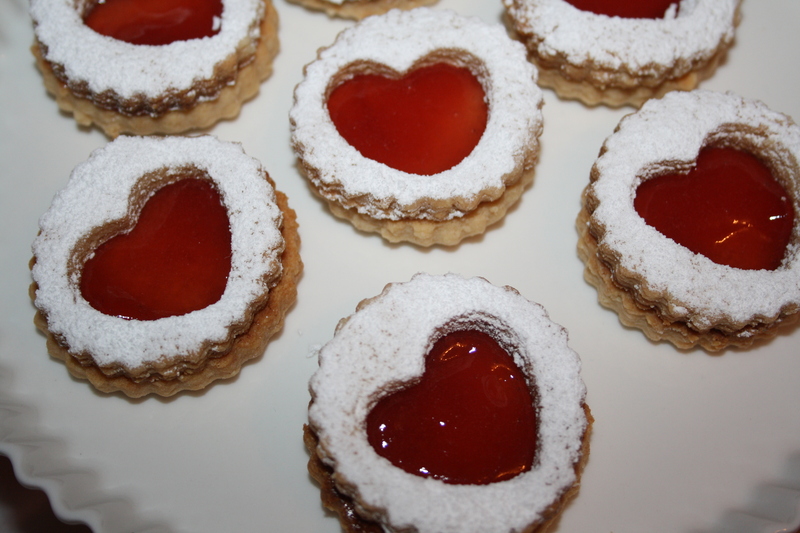 Also included were these lovely homemade cookies with seedless strawberry jam. Today we visited them for a little tea party and I gave them their Valentine bag early. I had included a book each about Valentines and wanted them to enjoy it leading up to the special day. It also included some chocolates and some tissues with pink hearts. 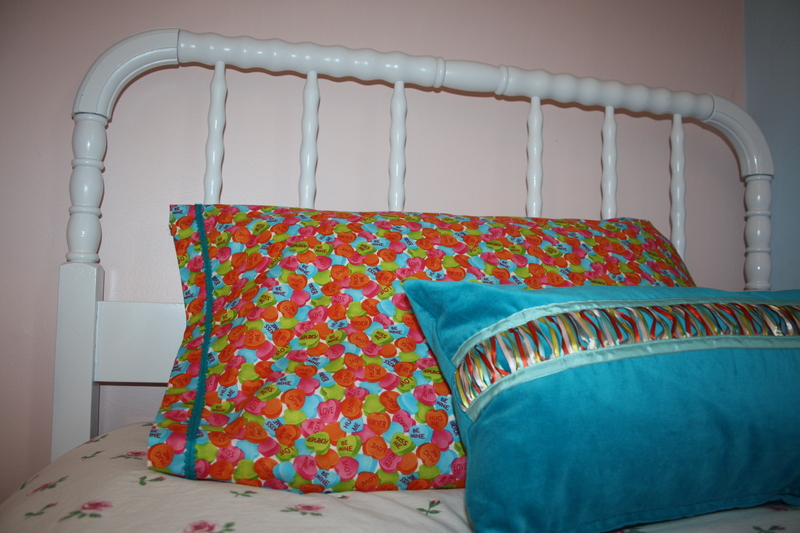 Tomorrow I will post a little tutorial on how to make a pillow case. It’s pretty easy actually and the little ones will just love them. 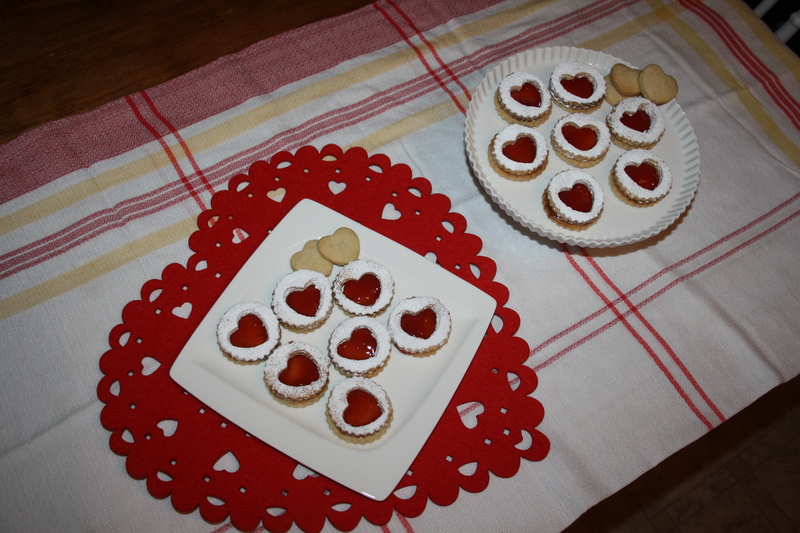 Categories: Uncategorized | Tags: diy, valentines | Permalink.